Storytelling is essential for brands today because if they don’t, others will tell their stories and essential elements may get lost. Feb. 14, 2007. It’s a day that always will stand out in JetBlue Airways founder and CEO David Neeleman’s mind—and not because it’s Valentine’s Day. Rather, that day represented the impetus for significant changes at his popular low-fare airline and also forced him to take a look in the proverbial mirror to honestly evaluate the company’s operations and its shortcomings. That day, an ice storm hit the East Coast, prompting a multitude of canceled flights among several national carriers. What separated JetBlue from other affected airlines was that the others responded by canceling flights early in the process and sending passengers home so that when conditions became more acceptable, they could resume schedules within a day or two. But JetBlue kept its ticket counters and airport gates open, leading to compounded problems that lasted into the following week. The storm had negatively impacted the airline’s communication system, meaning a large portion of the airline’s pilots and flight attendants were out of position. Also, its reservation system was undersized and ill-equipped to handle the increased volume of customers the company had grown to serve. The result was about 1,000 canceled flights during a five-day period, and plenty of angry exchanges between confused, weary customers and employees, prompting the airline to call security personnel, according to The New York Times. At the peak of the problem, nine JetBlue planes full of passengers sat for six hours or more on the John F. Kennedy International Airport tarmac. Shifting into crisis mode, Neeleman didn’t try to hide his company’s shortcomings or make excuses about the airline’s failures during the storm. Instead, he fessed up, took responsibility and vowed to make changes in the wake of the embarrassing episode. In fact, in a video message to customers, which can be seen on YouTube, he outlined a plan of action that included more training for non-airport crew members to provide assistance during emergencies; and making provisions for reservations agents to be more quickly accessed when customers have travel questions or difficulties. Moreover, Neeleman concluded by asserting the entire February experience would be an aberration because JetBlue would change its organization to ensure such occurrences would never happen again. That Neeleman was not only honest about the failures of his company during the February storm, but also that he apologized and told customers how JetBlue had learned from the incident and what it would do better were positive steps, says Blake Morgan, a customer experience futurist and author of “More is More: How the Best Companies Go Farther and Work Harder to Create Knock-Your-Socks-Off Customer Experiences.” And it likely helped that he used video tied to a social site to convey such transparency. According to a recent report from Sprout Social, 53 percent of consumers say they would be more likely to consider brands that are transparent on social media for their next purchase. The same report found that nine in 10 consumers say they are willing to give brands a second chance after a bad experience, and 85 percent say they will stick with brands during a crisis when they are more transparent overall. Clearly, brand or corporate transparency is on the list of important factors that consumers consider in the purchasing process, along with traditional factors like product quality or customer service. But how did this need for transparency come to be? 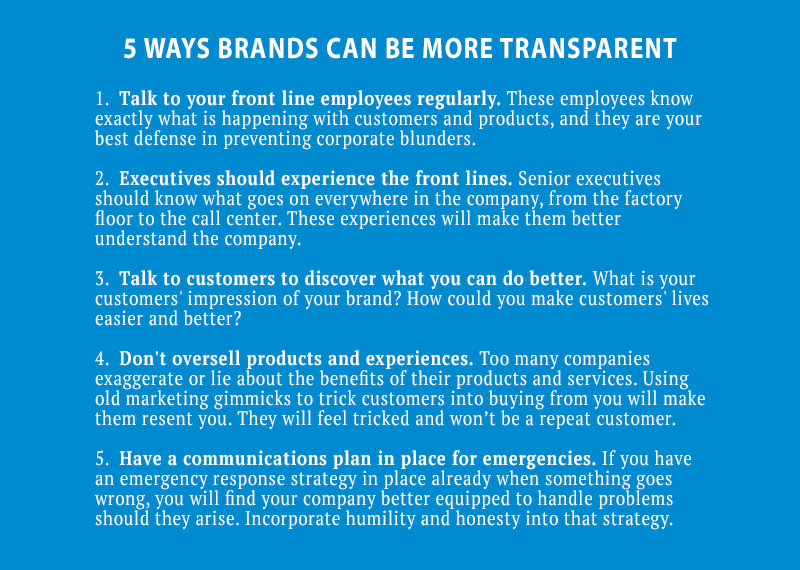 Moreover, given its importance, how can brands ensure they’re taking the correct steps to establish transparency, and what is the best way to do this? The Enron collapse. The Volkswagen emissions scandal. Facebook’s data breach involving Cambridge Analytica. Morgan says public deception by corporations and big businesses has fueled the demand for brand transparency from today’s consumers. Consumers demand this transparency, thus tying it to a company’s bottom line. Gone are the days of information being kept behind closed doors or C-suite executives being shielded from consumer engagement or scrutiny. Because of tools such as social media, employees and consumers alike have a platform. Moreover, consumers can force businesses that ignore the transparency demand to face dire consequences, Morgan says. “Social media has given consumers a powerful voice, and if they feel they are being mistreated by a brand, they have no qualms about letting their voices be heard,” she says. Social media has become an ideal way for a brand to tell stories because of ease of access and its direct link to consumers. This helps brands establish humanity in their customers’ eyes. Jillian Flores, director of brand planning at Moosylvania and co-author of “Join the Brand,” says she and Petersen discovered during research for the book that transparency is so effective—almost necessary—for brands because it can help fulfill people’s innate desire to belong. “We recognized that as more consumers find a sense of belonging in non-traditional communities, it was opening the opportunity for brands to not only evolve to act like friends through providing a greater sense of transparency, but also to play a key role in fulfilling that need to belong—turning ‘fandom’ into ‘super fandom,’” Flores says. Transparency during storytelling requires first knowing your brand’s story and why it’s compelling. Morgan says this can be done by analyzing the story’s tent poles and why they will resonate.